“I went into the kitchen today and found Betsy the washing woman busy over a tub with a Stuart tartan gown and her hair dressed for the occasion. She has charge of a family whose mother died in Spring and right in the middle of the floor stood the baby in its moss bag and cradle quite erect. Betsy lived as squaw with a Mr Randall who went home in the Autumn and whom the people in London have put into the house there. 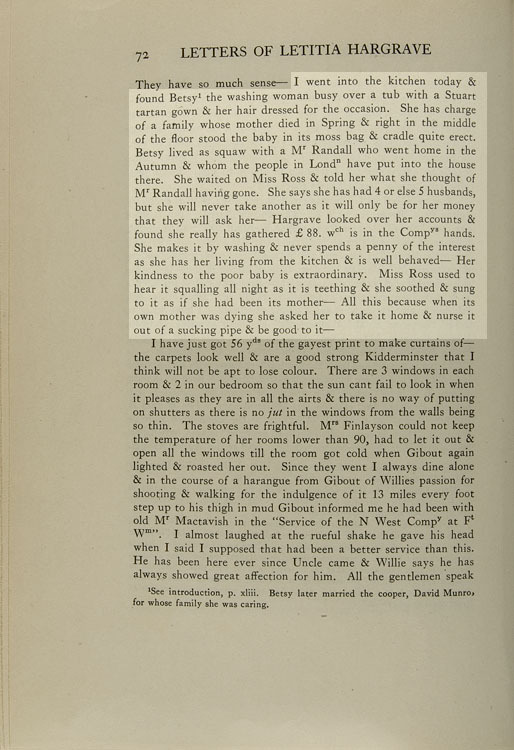 She waited on Miss Ross and told her what she thought of Mr Randall having gone. She says she has had 4 or else 5 husbands, but she will never take another as it will only be for her money that they will ask her – Hargrave looked over her accounts and found she really has gathered £ 88. which is in the Company’s hands.